One strength and weakness of CCEF is our name! In fact, we have had many discussions over the years about whether to change our name. Those discussions always end where they began, and our name remains unchanged. Surprisingly, the strengths and weaknesses of our name are due to the word counseling. Our debate is always about how the “c-word” both communicates and miscommunicates the vision of our ministry. First, there are strengths in coupling the words “Christian” and “Counseling.” Our name means that we are convinced that the good news of Jesus’ life, death, resurrection, ascension, present intercession, and promised return (the gospel) directly addresses the very problems that formal counseling and therapy address. At CCEF we are convinced that Christ brings hope to any and every conceivable personal and interpersonal problem. And even more, we believe that the redemptive actions and words of the Father, Son, and Spirit on our behalf always speak to both the seemingly mundane and the extremely complex problems that are a part of the fallen human condition. Because of the power of the gospel, we aim to practice and teach Christian counseling. We want to do this well and avoid being simplistic when we help people with complex struggles. We want to wisely engage secular psychology and psychiatry with wisdom formed by the Scriptures. We aim for a highly relational methodology that communicates the fathomless wisdom of the grace of Christ for sinners and sufferers alike. Though this is our goal, we do not claim to do this perfectly. We want to remain humble because we are in process ourselves. CCEF’s counselors and teachers need the same good news that we offer to others. Second, the narrow definition usually ascribed to the “c-word” is the weakness of our name. 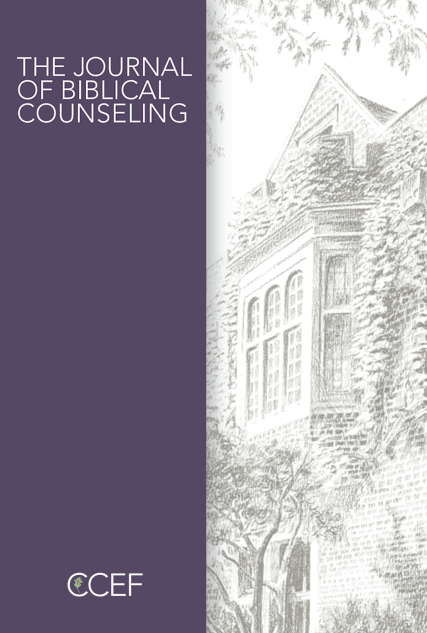 When you hear the word counseling, what comes to mind? Most people immediately think of a trained professional meeting privately with one person or a couple. In order to be useful, this trained specialist needs a psychology background far more than theological wisdom and genuine love. In addition, many people think of a counselor as someone who is well-versed in technical language and theories, and provides unique insight into people and unique power to help people change. And where can you access this kind of help? Most people do not think of the church as the location for this specialized help. Others may even conclude that the church has no business counseling. But this is not the only way CCEF understands and uses the word counseling. We use it much more broadly. When we say counseling, we do mean formal counseling, but we also find other words that capture it. Words that express the fuller meaning of counseling are discipleship, informal helping relationships, one anothering, growth in grace, conformity to the image of Christ, sanctification, change, growth in godliness, the fruit of the Spirit, faith and obedience, and increase in wisdom. Since this is what we also mean when we say counseling, then the church should absolutely be involved in counseling. Since churches should be involved in counseling, biblical equipping and training is needed. And that is exactly what we seek to do at CCEF as we restore Christ to counseling and counseling to the church. CCEF cares about the same problems that the church cares about. And because counseling is really about making wise application of the grace of God to people’s lives, then it is clear that counseling is what we as the church are called to do for one another. How can Josh and Sara change their bad marriage into a better one? How can Leslie deal with the grip that fear has on her life? Is there hope for people who struggle with addictions? Do the Scriptures offer any hope for people who struggle with depression, bi-polar disorder, or obsessive-compulsive disorder? Those situations may seem extreme, but the church can and must minister to these kinds of struggles. The church is the place to find help and hope for change. That is why CCEF is committed to helping local churches cultivate a culture of grace and growth—where people can find wise and compassionate help for a host of problems, both common and acute, both sins and sufferings. In saying all of this, I don’t want to imply that every person is completely competent to help anyone and everyone. There are people with unique gifts for inter-personal ministry just as there are people with unique gifts for public preaching and teaching. All of us are in different stages of life with varying degrees of training, life experience and case wisdom. That means that there are some who will function well in a more formal capacity and will engage in formal counseling. Likewise there are people within every local church with various gifts that God uses to walk compassionately with someone, to disciple someone facing the pressures of daily living, or to lead as an elder, deacon, small group leader, lay counselor, or mentor. When this kind of broad counseling is happening, you have a church living out the calling of Colossians 3:16, Let the Word of Christ dwell in you richly as you teach and admonish one another with all wisdom. As we grow in grace, the word of Christ dwells in us more richly. As a result, we are all better able to wisely teach and encourage others according to the gifts we have received. This, according to the apostle Paul, is the definition of a vibrant community. It is a Spirit-empowered community where everyone shares the privilege and the responsibility to minister to one another based upon personal gifts and calling. CCEF is honored to partner with churches that seek to live out this great and high calling.